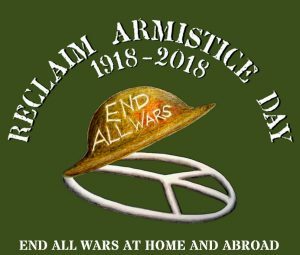 Celebrate Peace, Not War, on Armistice Day. “Armistice Day, the annual holiday held on Nov. 11, was a day to celebrate the end of a bloody war and promote world peace. 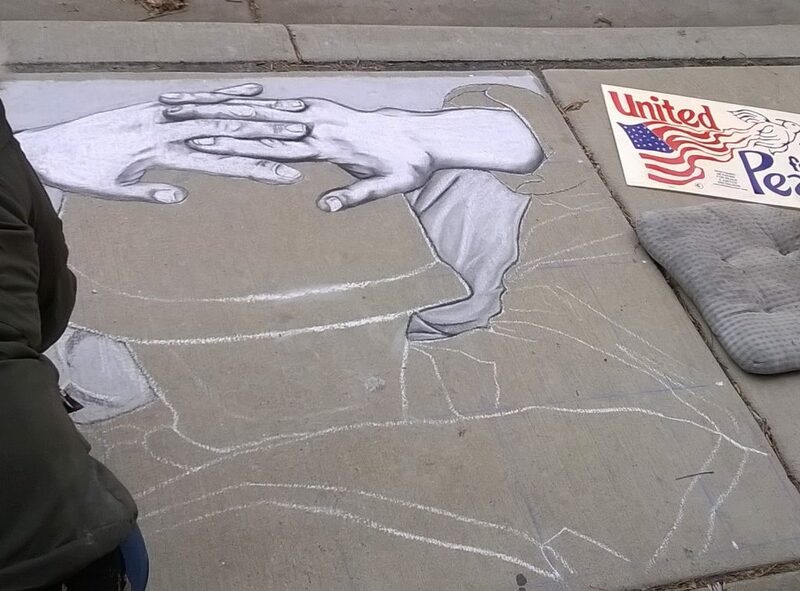 But since it became Veterans Day, it often seems to be more of a celebration and display of militarism. This year, the 100th anniversary of the end of World War I, is a time to reclaim the day for peace. 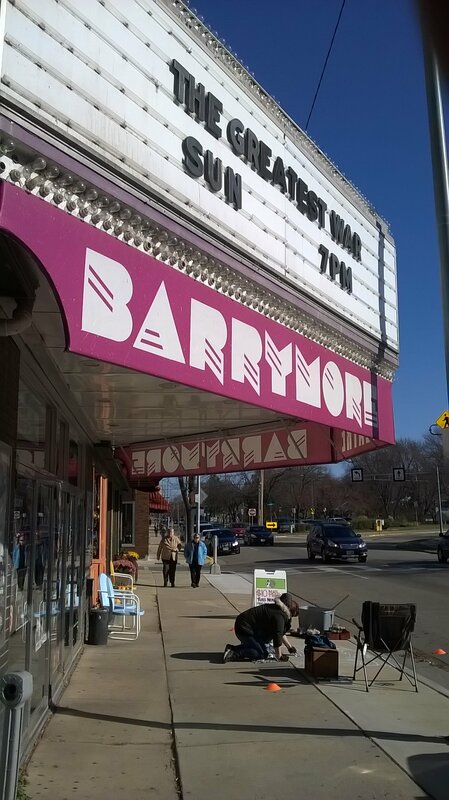 ..” – Bill Christofferson served in the U.S. Marine Corps in Vietnam and is a member of Milwaukee Chapter 102 of Veterans for Peace. 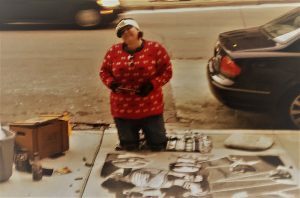 Amanda is a professional artist who does competitive sidewalk murals. We talk about her planned recreation of the iconic “Flower Power” photo outside Milwaukee City Hall, which she will be installing the afternoon before. Co-sponsors of the Milwaukee event: Veterans for Peace-Milwaukee Chapter 102, Peace Action-Wisconsin, United Nations Assn. of Greater Milwaukee, Women’s International League for Peace and Freedom, Greater Milwaukee Green Party, Unitarian Universalist Church-West, Progressive Democrats of America, Milwaukee Muslim Women’s Coalition, Democratic Socialists of America Milwaukee chapter, Friends Committee on National Legislation, Milwaukee End the Wars Committee, UWM Military and Veterans Resource Center, Milwaukee Turners, Inc., Milwaukee National Lawyers Guild, Wisconsin Poor People’s Campaign, Nukewatch, and Wis. Network for Peace, Justice and Sustainability. It was a cold, cold windy day but she persisted. 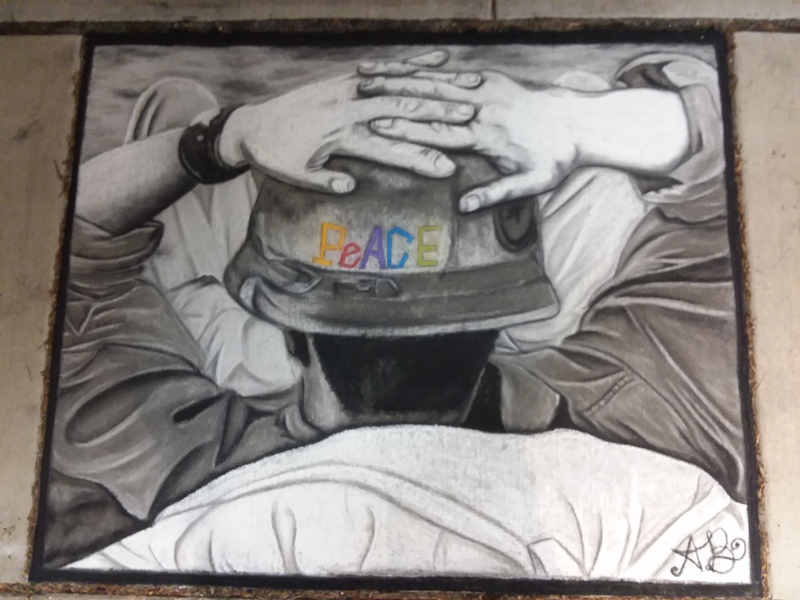 This chalk art piece is after a famous photograph called “Flower Power.” The photo was taken by Bernie Boston on October 21, 1967 during an antiwar march on the Pentagon. A man is seen placing carnations into the barrels of the rifles of a military police battalion. Makes me wonder if there were chambered rounds in those rifles. 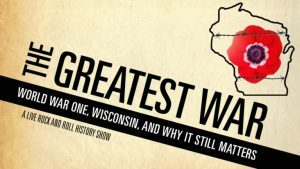 The Greatest War examines why this history is relevant today in a multimedia, live music exploration presenting new music featuring the music and lyrics of The Kissers, Sean Michael Dargan, November Criminals, and The Viper and His Famous Orchestra and graphic art in the background to help tell the story. The team that produced the event: Ken Fitzsimmons, John Wedge, Sean Michael Dargan, Jason Fassl, Leslie DeBauche and Yvette Pino. More music and pictures leading up to the event. 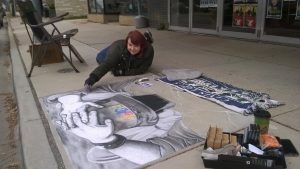 Amanda begins her chalk art drawing in Madison. Armistice Day was originally a day to celebrate peace and an end to war. 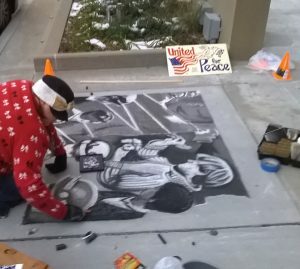 Veterans for Peace sees this as the best way to honor veterans. The goal of war should be to end war, that especially is the goal of those who serve. “We want generations after us to never know the destruction war has wrought on people and the earth. 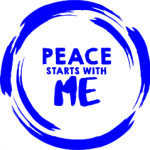 Veterans For Peace is calling on everyone to stand up for peace this Armistice Day. More than ever, the world faces a critical moment. Tensions are heightened around the world and the U.S. is engaged militarily in multiple countries, without an end in sight. 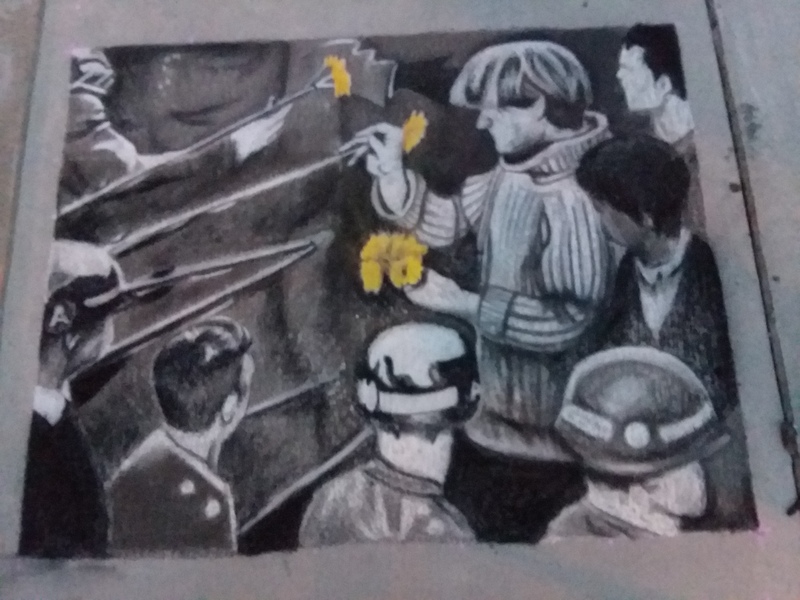 Here at home we have seen the increasing militarization of our police forces and brutal crackdowns on dissent and people’s uprisings against state power. We must press our government to end reckless military interventions that endanger the entire world. 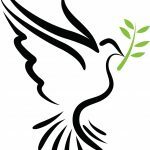 We must build a culture of peace. An American soldier wearing a helmet declaring “peace”, relaxes during the troop’s return to South Vietnam after operations in Cambodia. Soon after that encounter with Miss Krein, my mom gave me my first sketch book. I even remember the way that book felt in my hands. I started it at age 6 and finished it at age 12. Every year my pictures getting more and more detailed as I practiced. Creating things with my hands has always come easy to me like a magical power. “Chuckle”, if only everything else about life was so easy. Life on the other hand has been incredibly hard and choosing to see the beauty of the world around me rather than the suffocating doom is what has made my life beautiful and unique. My family supported me so much growing up. They were always awe struck by what I did, showering me with compliments. It was all of those compliments and encouragement that kept me going, kept me drawing, practicing, wanting more. There was never a time in my life when I wasn’t the Artist. I ate art for breakfast and lived on the high of making people smile. In high school I would skip lunches to go up to another class my Art teacher was instructing. All of my Art teachers welcomed me, taught me and made it so that my creative freedom would be limitless. My Senior year in high school was made up of all Art classes with the exception of one math class. Art and Earth Science were the only classes I got straight A’s in. As is with anything you love the most, it was what I was best at and most hungry to learn about. Now here I am as a mother doing my Art right along side my also incredibly artistic family. Hungry to learn, create and spread joy through my Art. In my Art you see all the many things I love. It personifies who I am and what I feel so deeply. My Art is my expression of the world I see in it’s endless and magical God created beauty. I’m beginning to get used to the idea of selling my art, although it’s hard for me. I’ve always gotten so much joy out of giving my art away for free. It’s my favorite way to spread love and humanity. Love and humanity is so desperately needed in this world today. This entry was posted in Clarence Kailin Chapter 25 on January 1, 2019 by Brad Geyer. So glad you did this. And that you were there to get the pictures. We did an interview with her on Riverwest Radio and talked about this. Alot of the people attending the Armistice day event were hoping to see it but the rain/snow mix had washed it all away by then so we couldn’t though I saw people looking for it. And I looked for it too. We wanted to put a photo of it on our website. We would gladly put a link to this site. And feel free to link to ours.